It is always a bit awkward when your little one has spent so much time on a drawing and then presents it proudly to you … but you have no idea what it is, when (of course) it must be plainly obvious to the artist who stands behind it. What do you say? What do you say when you look through the collection of your child’s artwork that have come home from school or kindy at the end of the term? This one is difficult, because even your child might not be sure of what their images are, having created them so long ago. For young children, art is an activity that allows them to express what they are thinking and feeling IN THAT MOMENT. It may be the movement that used while art-making that represents something for them, it may be they have discovered a new way of using the materials, or a new shape they like, or it may be they are representing something from a memory. It may be that while they were creating, their images may have changed from one thing to another in their mind … and often this is the case when children explain their pictures. Many is the time I have looked at one of my three year olds’s drawings, that I recognise as a car, only for him to say “No its a house!”, and then to go and show Dad the car he just drew! I have to admit, it is a relief when an image drawn by your child is distinctly recognisable, and clearly an image that isn’t going to change form through explanations. This stable sense of respresentation in art only comes after many many opportunities to practice creating form, which only comes when the brain is ready to translate thoughts into pictorial images, which comes when children’s language, cognitive and motor skills are synergised… which happen during play! And so we need to be patient and thoughtful when talking to children about the images they produce, and appreciate their representations with an awe of wonder about the body processes going on in the background! Your child’s collection of artwork has been created during a variety of experiences, through both guided and unguided creative time. Some of this work is an exploration of colour and form. Some of this artwork may represent themes, ideas, feelings or experiences that were very important and interesting to them in the moment. Some of this artwork was created in spontaneous play. Your child may remember these stories and experiences and wish to share them with you, or they may have forgotten about them the moment they hung their work to dry! All of this artwork, however, represents your child’s experiences of wonder, experimentation, imagination, physical growth and play. Receive this work in wonder and let your children be your guide when viewing it together. 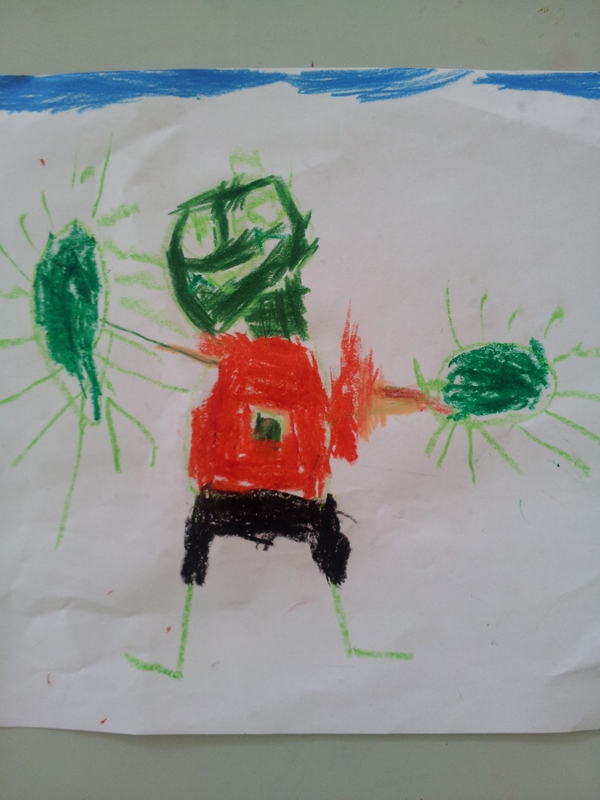 I found by being quiet while we looked at my children’s drawings from kindy together, that some would be passed over, some would be forgotten, and others they would launch into a detailed explanation that obviously had triggered the memory of a powerful experience that led to that drawing. ♦ Ask for the story: encourage children to talk about the meaning behind the artwork by asking them why they decided to place images (such as suns, rainbows, cars…etc) in their work.”Would you like to tell me about your picture?” or “What were you thinking about/imagining when you created this?”. ♦ Comment on the effort children make while engaged in the art making process. Let them know you value their effort as much as the final process. There is not a right or a wrong way to discuss children’s artwork, but it is a process of being mindful of what they are capable of discussing when it comes to talking about their images. Try all the above suggestions! Wait and observe silently at first. Then if you feel that a response is expected, talk about what you see in terms of lines and colour (no value judgments! Knowing that we like their use of red is a risk if red represents something they are unhappy with! ), reflect on how and why, ask if the picture took a long time to draw, let them know how you appreciate their efforts and thank them for sharing it with you! It may be they do not wish to tell you about their picture, or they don’t have words to describe it. Perhaps they cannot remember or do not wish to share what they were thinking about. If this is the case, then receive in loving silence. A warm gesture such as a smile a hug and thank you will be enough. Another suggestion is to appreciate other artists’ work with your child. Go to the art gallery and the museum, borrow art books from the library. Display beautiful and interesting images in your home. You don’t have to critique each and everything you see, but the more your child sees of artwork in the world, the easier it will be for them to transform their experiences into artwork of their own and talk about them with you.